I am a total dessert girl. I could eat dessert three times a day and be happy. Sometimes I do. But there are those rare occasions I do crave something crunchy and salty. CheeseCrisps have always been a favorite of mine. But they are expensive and they aren’t very healthy. I was playing around with my butter, cream cheese, baking mix dough the day I made my baklava cookies and had the inspiration to make it savory. It worked like a dream. I doubled this recipe and made half into cheese crisps and half into crackers. They were both really good. 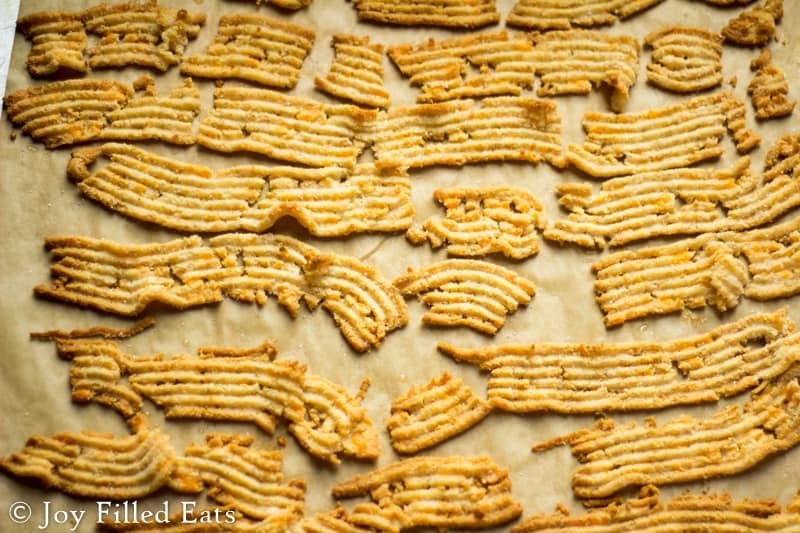 The crisps are a little more delicate and dealing with a cookie press can be a pain but I think they are worth it. They pair perfectly with soup or just as a snack on their own. The crackers go well with sliced cheese. I even put some into a little snack sized container with squares of ham and cheese. 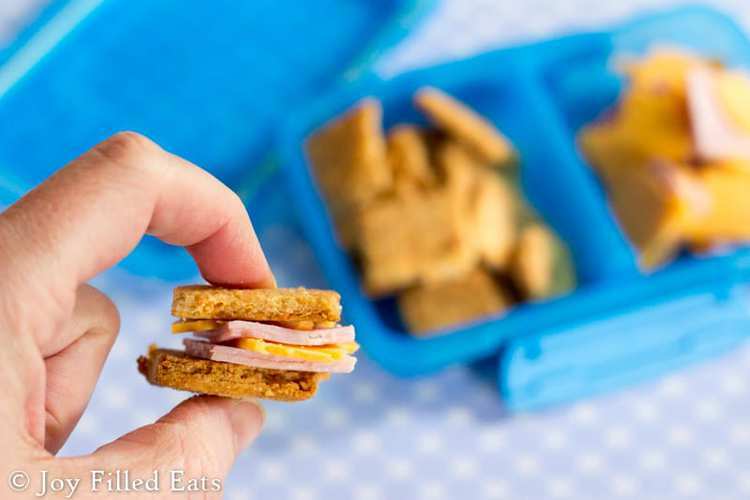 It reminded me of a healthier version of the Lunchables my kids always beg me to buy when we are in the store. Mix all ingredients with a wooden spoon in a medium bowl. It should come together easily if the butter and cream were at room temperature. I kneaded it with my hands for a few minutes to make sure it was mixed thoroughly. 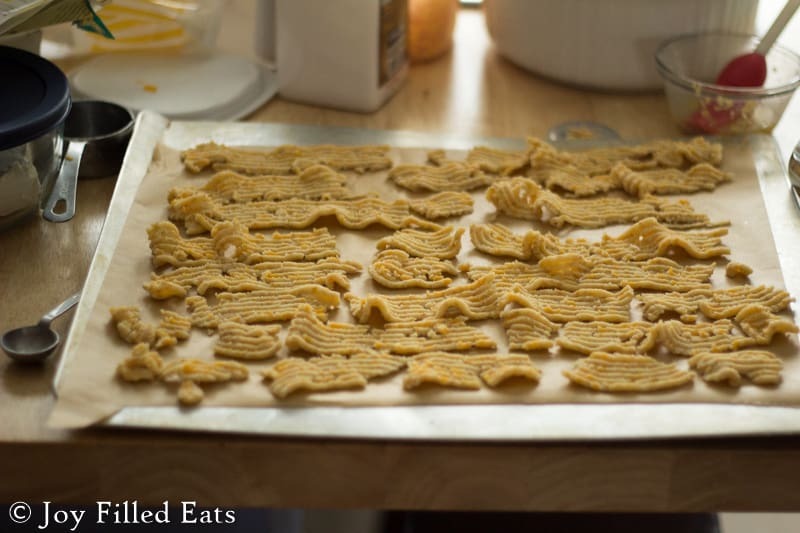 To make cheese crisps: Put the dough in a cookie press with the bumpy line attachment. (Descriptive, I know. Basically it’s a one inch line opening with one flat side and one side with ridges). Press the dough through the cookie press onto a parchment lined baking sheet. If desired brush with extra melted butter and sprinkle with a tiny bit of garlic powder. Bake for 12-15 min out until golden brown. 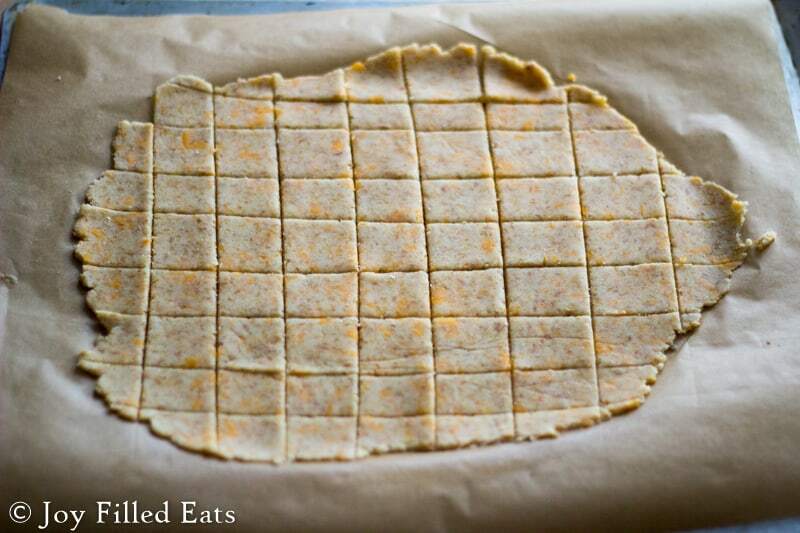 To make crackers: Roll out the dough between two pieces of parchment paper until it is about 1/4 inch thick. Remove the top piece. Cut with a pizza cutter into squares. If desired brush with extra melted butter and sprinkle with a tiny bit of garlic powder. Bake for 15-20 min out until golden brown. Need a salty snack? 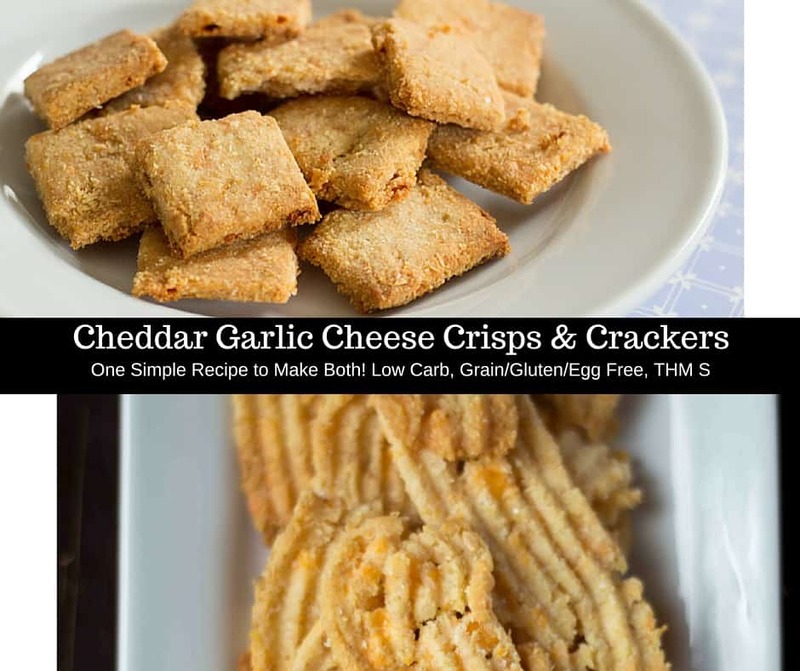 Try my cheddar garlic cheese crisps! 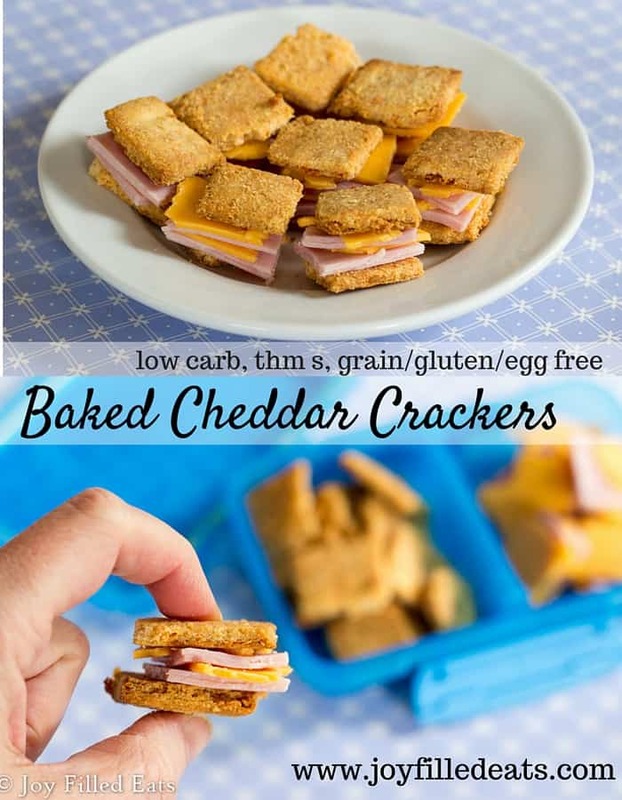 They are low carb, keto, and gluten-free! 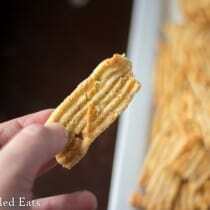 To make cheese crisps/straws: Put the dough in a cookie press with the bumpy line attachment. (Descriptive, I know. Basically it's a one inch line opening with one flat side and one side with ridges). Press the dough through the cookie press onto a parchment lined baking sheet. If desired brush with extra melted butter and sprinkle with a tiny bit of garlic powder. Bake for 12-15 min out until golden brown. I am very excited to try these (I feel that finding something "crunchy" is all that I am missing... as I have found plenty of recipes for my sweet tooth.) Thank you for posting this!! Hi, do you know approximately how long these could be stored if kept in an airtight container? Thanks! I keep these in the fridge for weeks. I wouldn't leave them out for more than a day or two. These are my go to snack when I want a crispy, salty snack! I leave mine in the oven a bit longer because I enjoy them crisp. 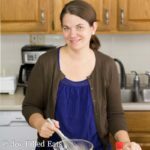 I can't use almond flour due to a severe allergy. Do you have a recommended substitution? You could try using a combination of ground golden flax and coconut flour. Start slow when adding the coconut flour because it is drier than almond flour. What was the cookie press that you use for this? I looked on Amazon but it was very difficult to see if the Press contained this exact disc. What is the name brand, maybe they have one on Amazon. Thank you! I am not fond of the taset of. Does coconut flour taste like coconut? If so, Is there a substitute for coconut flour? You can use additional almond flour. These had a very very slight coconut taste. My family didn't notice but I could taste it. I have done some research and have found out that flaxseed & chia seeds are very high in estrogen. 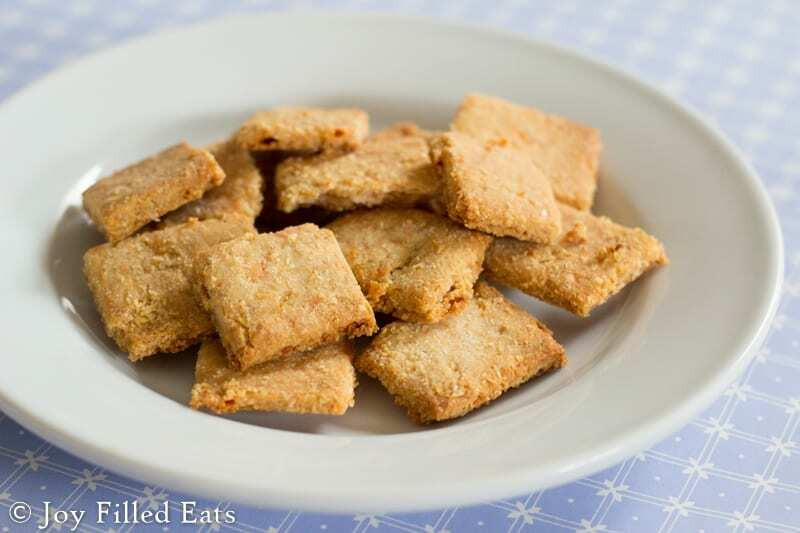 Could you make these crackers without the flaxmeal or will the dough not bind together. Would I add more of the other 2 flours? Thanks for great recipes. You can add more almond flour. Tried these today, and they are wonderful. 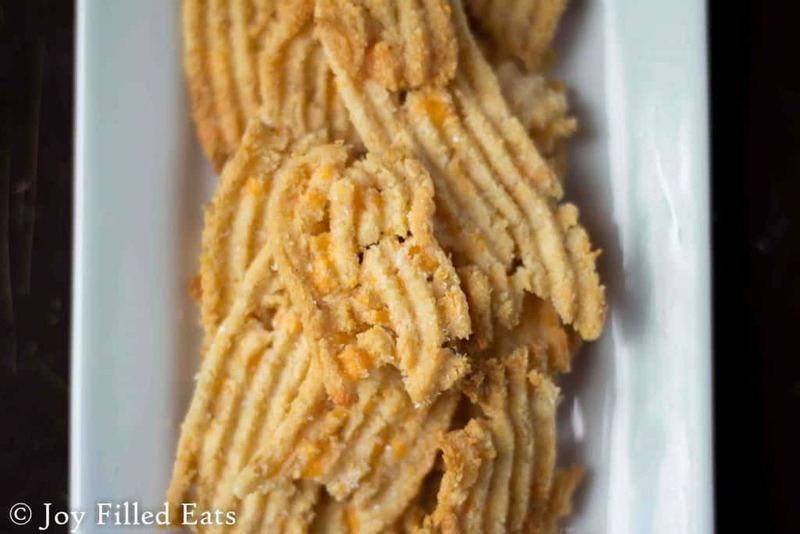 Reminded me of the expensive cheese straws I love. The flours gave it a lightness that is remarkable. Also the golden flax flour/meal gives a wonderful crunch and good color. Will definitely try using the cookie spritz tool in the future for the other type you mentioned. I understand the net carb idea but first calculated the carbs for the entire batch and it came to 75 carbs for the flours/meals. The net for carbs after deducting the carbs from fiber was 27 for the whole batch. Either way seems okay to me. Definitely a reduction. I tried them today and it's really delicious. But they didnt keep the shape... All melted. I used hazelnut and coconut flours... Tks!! I'm not familiar with hazelnut flour. Sorry. If you try again just add more until it is the consistency of pie dough. As I made these this evening, I started eating the raw dough right off the parchment paper. It was so delicious. Tasted just like my favorite crackers I don't eat anymore. After baking they are phenomenal. My, how I missed crackers after starting low carb. These are great on their own, with cheese, or to scoop up a creamy spinach dip! Loved them. I made the cracker version, best LC cheese cracker that I have googled up and made. Am going to make another batch on the weekend so I can stash a little baggie of them in my handbag to nibble on at a non GF cocktail party! That way I know I will have a delicious savoury snack to accompany my champers! I made these last week. Totally loved them. I'm wondering if I could add a splash of Worcestershire sauce? I haven't tried it but that's a great idea :-) I don't see why it wouldn't work. Today I added the Worcestershire sauce! They are even more delicious! Can you give nutritional info on these? Serving size, calories, carbs, etc? Hi Bonnie, I just added it to the post. Any idea how many servings this should be if making crackers about the size of wheat thins? Not really, sorry! It made a lot. Hello! These look great and am interested in trying them but I don't see any cheddar in them as the name implies? So sorry, I just edited the recipe. It calls for 1/2 cup shredded cheddar. Sorry, that was a typo. They need 1/2 cup shredded cheddar.